Bruins right wing Brian Gionta (12) scores a goal on Flyers goaltender Alex Lyon (49) during the first period of Thursday's game at TD Garden in Boston. 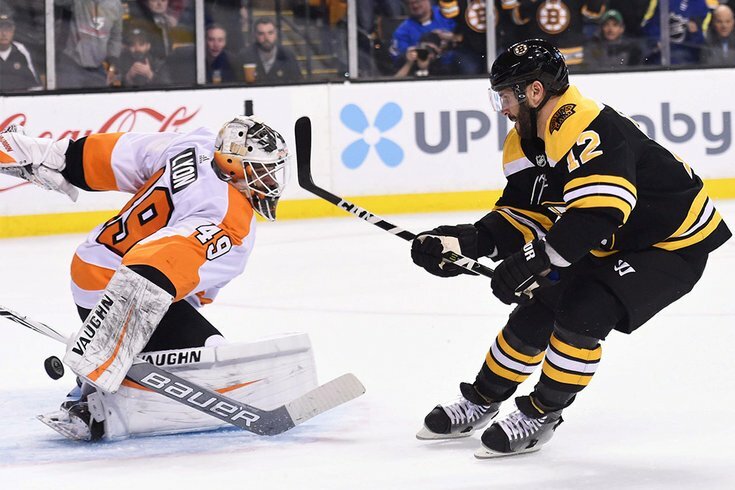 It doesn’t look good, even though for most of Thursday night’s game in Boston, the Flyers looked very good, even better than one of the better teams in the NHL. The result, however, has been the same for a week, and if the Flyers don’t fix the bleeding now, their playoff hopes could sink. The Boston Bruins beat the Flyers, 3-2, on a Brad Marchand goal with 22 seconds left in the game. The Flyers’ power play has been anemic, scoring only two goals in their last 24 chances. They’re 0-4-1 in their last five games, and sit third in the NHL’s Metropolitan Division at 34-23-11, good for 79 points, three points behind the first-place Pittsburgh Penguins, yet seemingly light years away. The power play has been ineffective because the Flyers are making errant passes out of impatience. That couldn’t have been more evident in the Flyers' play against the two-time defending Stanley Cup champion Penguins Wednesday night. “Power play was [poor] tonight and it’s frustrating. We did a good job of drawing those penalties and gaining momentum and it wasn’t good,” Flyers’ captain Claude Giroux said after the Pittsburgh loss. Some errors of the past have crept back into the Flyers’ game, things that appeared to be cured since their 10-game winless slide back in November. The most egregious seems to be the Flyers’ penchant for turning the puck over. Against Boston, Nolan Patrick wasn’t strong with the puck coming from the Flyers zone and lost it, which led to Boston’s Riley Nash scoring. What's been so maddening about this season is that the Flyers can be so good at times, which they were against Boston — stopping three Bruin power plays and scoring a short-handed goal, and Alex Lyon making 24 saves. Then, they suffer a breakdown, which they also did and it led to Boston scoring in the game’s final seconds. “Hard to swallow,” Flyers coach Dave Hakstol said afterward. “It was a point we felt we deserved. Our guys worked their tails off and it’s hard when you have nothing to show for it at the end of the night. “We took a big step in the right direction. We got back to who we are tonight. Sometimes you get stripped down to your core on the back-to-backs. That was the case tonight, but the guys dug down. We played a pretty simple road game and everybody dug in. The Flyers host Winnipeg on Saturday and the Las Vegas Golden Knights on Monday. They’re again faced with the tough task of having little wriggle room as the playoffs near — and only have themselves to blame for it.